BROOKINGS, S.D. 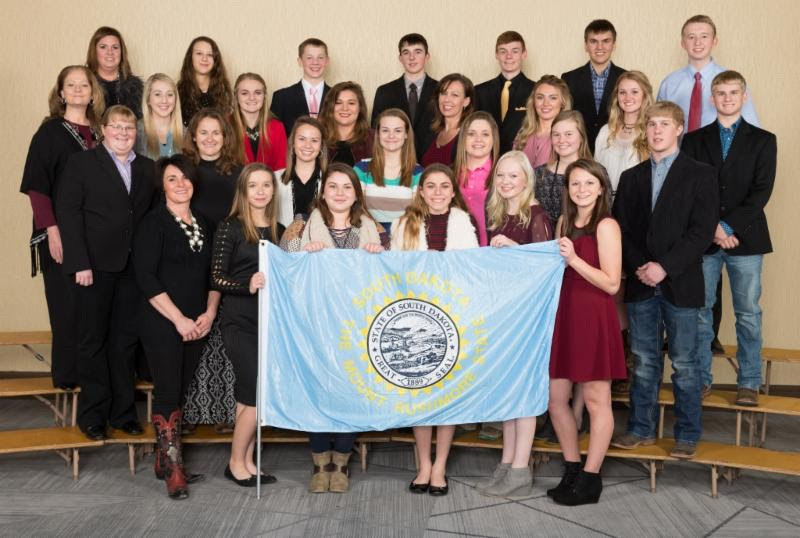 - Twenty-one South Dakota 4-H members represented the state, competing along with more than 1000 youth from more than 33 states including Alberta, Canada attended the Western National Roundup January 4-7, 2018 in Denver, Colorado. The trip from South Dakota to Denver was sponsored and funded by the Livestock Industry 4-H Trust Fund. Livestock Judging Team Members: Sawyer Naasz, Brule County; Hunter Miller, Deuel County; Jadee Mattheis, Hutchinson County and Mitchell Vander Wal, Spink County; the team was coached by Amber Erickson and John Keimig. Horse Judging Team Members: Cassandra Townsend, Brown County; Adrianne Schaunaman, Brown County; Callie Mueller, Codington County and Jessica Mueller, Minnehaha County; the team was coached by Mysty Schaunaman. Hippology Team Members: Dani Holm, Minnehaha; Hannah Buchmann, Minnehaha County; Jami Bergeson, McCook County and Samantha Bergeson, McCook County; the team was coached by Melissa Ullerich. Horse Bowl Team Members: Blayne Martinez, Hutchinson County; Hunter Haberman, Hutchinson County; Justin Edelman, Hutchinson County and Lexy Leischner, Hutchinson County; the team was coached by Jill Haberman. Horse Demonstration: Sarah Vos, Pennington County and she was coached by Dallas Vos. Consumer Decision Making Team Members: Bridger Gordon, Butte/Lawrence County; Danika Gordon, Butte/Lawrence County; Collin Hockenbary, Butte/Lawrence County and Layla Hockenbary, Butte/Lawrence County; the team was coached by Jamie Hockenbary. The Conference, now in its 98th year, is held annually in early January, coinciding with the National Western Stock Show. This year's theme of "Unmask the Superhero in YOU" is aimed at helping participants gain confidence to help them create unique experiences for both themselves and others and thrive in their self-defined future through 4-H and FFA. Both 4-H and FFA members between the ages of 14 and 19 have the opportunity to qualify for Roundup by winning their home state's contest or being chosen as a state delegate. The competitions held at Western National Roundup include horse and livestock judging, livestock quiz bowl, hippology, horse demonstrations and public speaking, parliamentary procedure, family consumer sciences presentations, skill-a-thon, and bowl, consumer decision making, public speaking prepared and impromptu, parliamentary procedure, and meats identification. Workshops are offered throughout the week which provide a learning experience for the youth exposing them to topics ranging from fitness and nutrition, to communication and team building, to dance and leadership development. Youth participants develop a mastery of their respective subject matters, but more importantly, gain life-long skills. Such skills as public speaking, professionalism, and good sportsmanship along with the memories and new friendships will outlast the trophies and ribbons that were won. For further information about Western National Roundup and full results for each contest, please see the main conference website at http://www.westernnationalroundup.org/. SDSU Extension's 4-H Youth Development Program is a partnership of federal (USDA), state (Land Grant University), and county resources through youth outreach activities of SDSU Extension. Youth learn and experience Leadership, Health and Wellness, Science and Ag-Vocacy through a network of professional staff and volunteers reaching more than 9,000 enrolled members with yearly programming efforts to an additional 35,000 youth participants.